If you have multiple blogs and would like to have recent posts from your other blogs being populated at your blog’s sidebar, there’s a few Wordpress plugins for it. 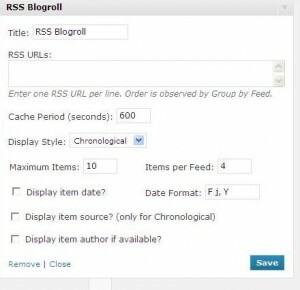 I have installed the RSS Blogroll plugin by Greg Jackson (visit plugin site). For instance, at this blog, you can see that there’s a sidebar content of “More Recent Posts from My Health Blog” and “More Recent Posts from Other Blogs”. Not long after a publish a new post at another blog, it will automatically be populated at my blog’s sidebar. I need not manually link and update the title on my sidebar. After in installing the blogroll, I have find an increased number of traffic brought in by my other blogs. For instance, the traffic for this blog had grown because my health blog was referring traffic to this blog. When visitors like the topic of some of my blog posts that they have seen via my blog’s sidebar, they will click on the topic to come to the blog. And not having to manually login and update the new posts myself have been a great relief. RSS URLs: Get the RSS url for the blog that you want to link to. To get the RSS feed of the url, go to the RSS feed button that you can usually find in most blog. You can put the RSS urls of a few blogs here. Cache Period: You can put up to any period you want. If the other blogs are not updated often, you can have a longer cache period. Once you save the changes, the blog recent blog posts from your other blogs or from your favourite blogs will appear on your sidebar widget.